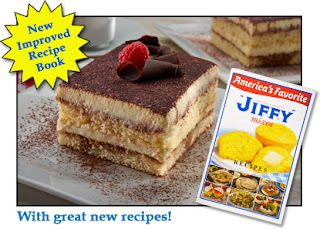 For recipes using JIFFY mixes, order your FREE copy of the Hospitality in a JIFFY Recipe Book. Many new and updated recipes along with some of their old-time favorites. Recently updated to include new recipes! ♥ JIFFY Sugar Cookie Mix. The Jiffy Recipe Book is available online in an electronic format too! Looking for more delicious Jiffy recipes that have not yet been added to their book?